Dr. Spencer S. StCyr, DDS has been recognized as one of the top Eldersburg Dentistry practices. 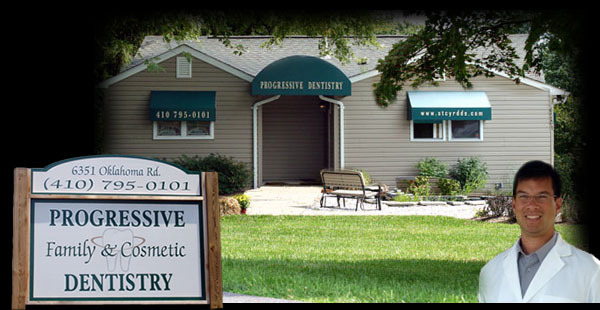 Progressive Family and Cosmetic Dentistry has been serving the oral health needs of our patients since 2001. Dr. St. Cyr, and his staff, offers patients the latest advances in dentistry through continuing education and cutting edge technology which enables us to provide comprehensive oral health and esthetics for your entire family. In our office, we are here to provide caring, affordable quality, progressive family dental care, promptly and professionally. We specialize in preventive care, general treatments, orthodontics, peridontics, and cosmetic dentistry. We care about your dental health and comfort – and are committed to healthy smiles. At Progressive Family & Cosmetic Dentistry, you and your family can expect complete dental care, including patient education in oral health. Your overall dental health is our long term goal. 6351 Oklahoma Rd., Eldersburg, MD 21784. We will be closed on Dec 25, Dec 26, and Jan 1 for the holidays! Be safe and have a wonderful holiday! Our office is in Carroll County Maryland, just over the Baltimore County / Carroll County line in South Carroll. (Map and link to driving directions.) At the intersection / traffic light of Liberty Road, Ridge Rd, and Oklahoma Rd, you will see the Eldersburg Commons shopping center on one corner, Shell's gas station and McDonald's are on the other corners. Turn towards McDonald's on Oklahoma Rd. Our offices are located about 435 feet on the right. McDonald's and Oklahoma Rd Middle School will be on the left. Turn into the driveway on the right across from Dickenson Rd. Keep to the right side of the driveway and park in our private lot. Serving the dental needs of families throughout Carroll County for over 15 years. Our dental offices are located in the Eldersburg / Sykesville area just over the Carroll County line. We are convenient to Baltimore County, Carroll County, Howard County, and Baltimore City. Providing experienced, compassionate dental care services for the communities of Eldersburg, Sykesville, Marriottsville, Finksburg, Mount Airy, Taylorsville, Glyndon, Reisterstown, Owings Mills, Deer Park, and surrounding areas. Conveniently located in South Carroll on Oklahoma Rd. at the intersection of Rt 26 Liberty Rd, Oklahoma Rd, and Ridge Rd, with the Eldersburg Commons Shopping Center, McDonald's, and Shell Gas Station. (click here for driving directions). This website is for informational purposes only and should not be construed as medical advice. If you have questions regarding dental care, please contact us and we will setup an appointment for you.